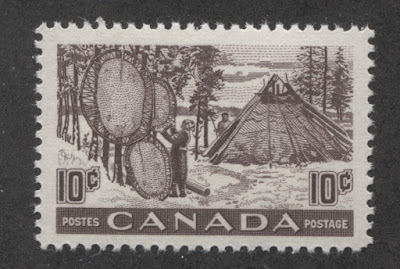 Today's post will be much shorter than in the past several weeks and will look at the high value definitive stamps that began to replace the designs of the 1946 Peace Issue, starting with the 50c in 1950. 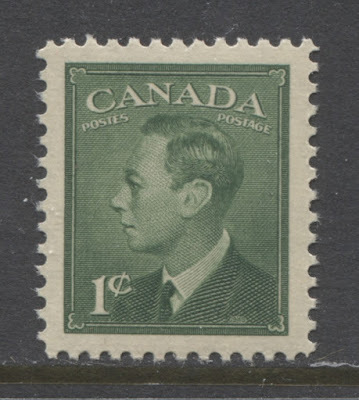 They are interesting stamps because they technically occupy both the end of King George VI's reign, as well as the very beginning of Queen Elizabeth II's reign. So they really ought to be included in your collection if you are a specialist of either reign. Although they do not display quite the same range of paper, shade and gum varieties as the earlier Peace Issue, there are still some worthwhile varieties that can be collected. I will illustrate most of them here, though there is one very dull, cold shade of ultramarine on the $1 fisheries that I do not currently have an example of. I bought a 1c orange Large Queens on the scarce paper 9, that is not the thin paper. I note that Unitrade this year has re-named the thin tissue white paper as paper 9A, and has listed the paper 9, which it calls smooth, white. So I have added a scan of the paper 9, and have amended the heading of the former paper 9, to now read "9A".